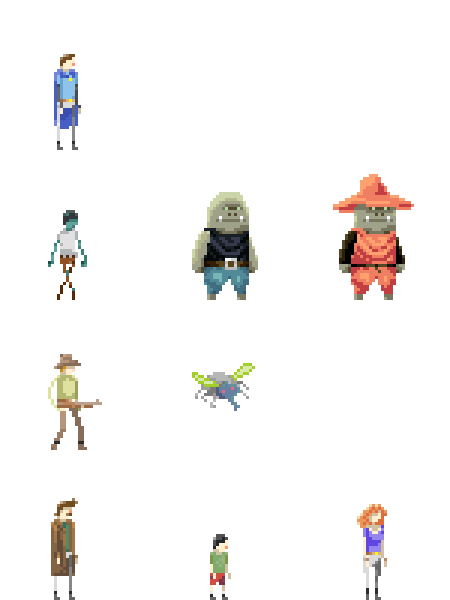 The chara designs I made so far, for my 2D platform-action game. I began with the player character (character in blue, on the first line). I wanted a style simple enough to be handled by a non professional drawer, and chose to try a pixel art style like Superbrothers: Sword & Sworcery (which I haven't played yet. But I found the screenshots amazing). 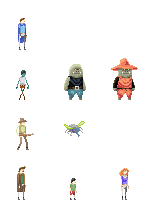 So, no black borders on sprites, and a one pixel width for arms and legs. The second and third lines show enemies. The "fat" enemies (second and third) don't respect one of the rule (one pix width for arms & legs), and I must admit they are the one I had the most fun to draw and animate. So if I had time, maybe I should redraw all characters with that style, I don't know yet. On the fourth line, I put some friendly NPC, giving advices and selling stuff to the player. They will have simple animations, like this one below. Feel free to comment if you have remarks or advice, or just to say if you like it or not !